What are the most important benefits of QBS? How does QBS benefit the community? How does QBS benefit the agency? How does QBS benefit the contractor? How does QBS benefit the taxpayer? How widespread is the use of QBS? How long has QBS been in use? Is QBS more costly than cost-based procurement? Does QBS eliminate price competition? What are the general services engineers and archtects provide? How are architectural and engineering firms retained? Why not bid out services? Can QBS be used with design/build projects? What other types of firms are selected through qualifications-based selection? Does this process inhibit competition? Q. What is qualifications-based selection? A. Qualifications-based selection is a method of procuring engineering and architectural services that makes superior qualifications and experience the paramount basis for selection. Q. How does QBS work? A.The specific details may vary slightly throughout the country, but the Brooks Architect-Engineering Act of 1972, which mandates QBS for all architectural and engineering services procured by the federal government, is the model for most QBS programs. 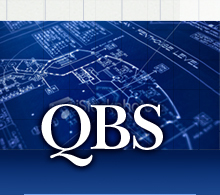 For more information please refer to the QBS Process section of the IL QBS website. Q. What are the most important benefits of QBS? A. It all comes down to technical quality - i.e., safety, functionality, maintainability and life-cycle costs - and long-term savings. Q. How does QBS benefit the community? A. QBS results in projects with the best design solutions to meet the needs of the project, emphasizing public health, safety and quality of life. Q. How does QBS benefit the agency? A. QBS allows for selection of the most highly qualified firm with the best experience, capabilities, technical approach and quality of personnel, matched to the needs of the project and the agency. Q. How does QBS benefit the contractor? A. QBS results in better plans and specifications, which generate higher quality contract documents that make it easier to bid on and carry out construction. Q. How does QBS benefit the taxpayer? A. QBS fosters the development of innovative, cost-effective design solutions at a fair market value, resulting in lower overall project costs, minimizing delays, cost overruns and litigation, and lowering operating and ownership costs. Q. How widespread is the use of QBS? A. QBS is the preferred procurement process throughout the U.S., used successfully by the federal government, 42 states - including Illinois - and most local governments. Q. How long has QBS been in use? A.Legislation mandating QBS has been in place for 35 years on the federal level, and for over 20 years in local Illinois governments. 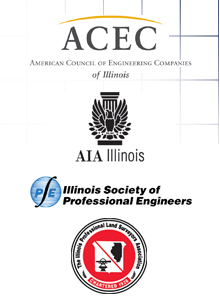 Traditionally and historically, qualifications-based selection has been used to select engineers and architects for design of the nation's public works, as well as the Illinois Highway System, the Illinois Tollway, and public schools from elementary through university. In 1972, QBS was officially mandated for federal projects through the passage of the Brooks Act. Similarly, in 1987 Illinois passed the Local Government Professional Services Act and in 1991 passed the Architectural, Engineering, Land Surveying Qualification Based Selection Act for state agencies. Q. Is QBS more costly than cost-based procurement? A. No. In fact, in the long run, it saves money. Price-based procurement may sometimes result in a lower initial design cost, but qualifications-based selection generates a better project with lower overall costs - from design through construction to ongoing operation and maintenance. Moreover, the fee for the design professional amounts to only a small percentage - according to Dunns, a leading construction industry publication, less than 1% - of total life-cycle project costs. Q. Does QBS eliminate price competition? A. No, price always is a factor. The difference is that price comes into play later in the selection process, after the highest technically ranked firm is selected and the project scope is fully defined. QBS generates a realistic fee based on a fee proposal by the consultant and negotiations with the agency. If the agency cannot negotiate a fair price with the first choice of consultant, it has the option to open negotiations with another highly qualified consultant. Q. What are the general services engineers and architects provide? A. The basic phases of service on a typical project are feasibility study, preliminary design, final design, construction bid evaluation, and construction observation. Architectural projects often include a detailed programming phase that would precede actual design work. Q. How are architectural and engineering firms retained? A. The traditional method of hiring engineering and architectural firms for public work is through a process known as negotiated procurement or qualifications-based selection. The basic goal of this selection procedure is finding the best qualified firm or individual to perform the work. There are six major elements to this procurement procedure: public notice, submittals of qualifications, review of submittals, interviews, ranking respondents, and negotiation of a contract. Q. Why not bid out services? A. The process for selection of a firm to construct a project differs from that used in the selection of a firm to design the same projects. A construction contract can be awarded to the lowest responsible bidder because all major aspects of the project are defined, including the type and amount of construction materials required to complete the project. On the other hand, you retain architects and engineers to turn your undefined concept into a set of plans and specifications. The engineers and architects take an idea and give it definition. The contractor takes that definition and turns it into a physical reality. Q. Can QBS be used with design/build projects? A. Yes, it can. Design/build is an alternative delivery process. When design/build is utilized, QBS should be used to select the design/build team. Some organizations advocate a two-step process where first an owner representative is selected and then second a design/build team is selected. More detailed information is available from the ILQBS sponsoring associations. Q. What other types of firms are selected through qualifications-based selection? A. All professional design firms should be retained for public works through qualifications-based selection. This would include, in addition to engineering and architectural firms, geotechnical, landscape architectural, photogrammetry, planning, owners' representatives, environmental consultants, and surveying firms. Design firms frequently offer combined services. For example, many firms provide both architectural and engineering services, hence the term A/E. Many civil engineering firms also provide land surveying services. Q. Does this process inhibit competition? A. Not at all. It simply focuses competition for professional services on the most meaningful factors: qualifications, competence, previous performance, and availability.